First prepare the chia mix as egg replacement. Mix water with chia seeds and set aside for some minutes. Season the cooked broccoli, e.g. with cumin, then chop it into small pieces (if you have a food processor you can use it for that). Preheat the oven to 160°C (circulating air). Mix the liquids with chia mix and then add flours and broccoli. Crumble in the feta cheese. Finally add baking powder and mix everything well. 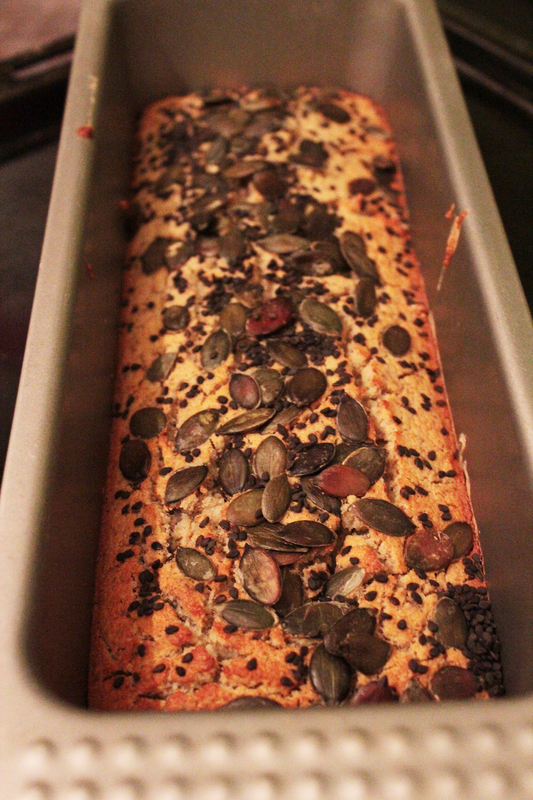 Pour into a muffin baking tray, scatter pumpkin seeds on top and bake for about 20 minutes. 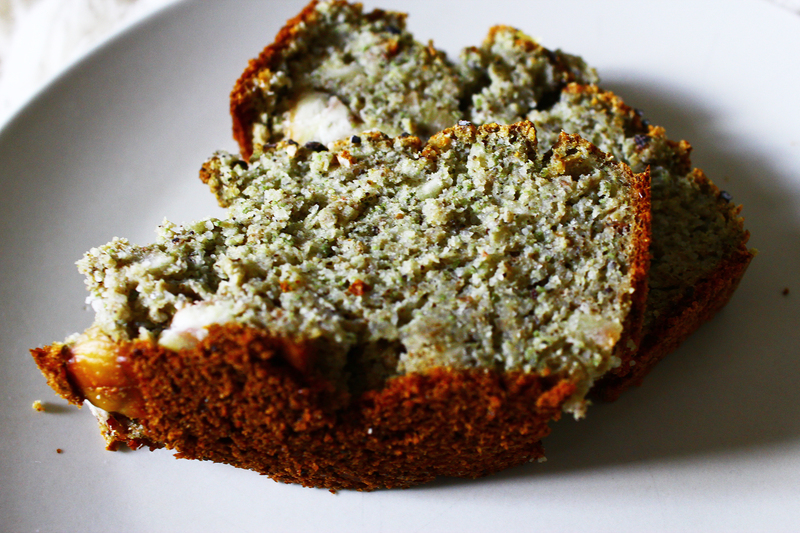 The muffins make a great breakfast or will serve you as a snack when on the go. Why mix your own gluten free flour mix? When suffering from HIT AND a wheat allergy or gluten intolerance and alike, you should definitely mix your own gluten free flour mixes. Gluten free flour mixes you can buy and gluten free processed foods often contain ingredients which are rather problematic with HIT, e.g. lupine protein, cellulose, carob gum, yeast, glucose syrup, soy bean flour or guar gum. Some of those you just don’t want to eat in general (cellulose for example), others are actually problematic when it comes to excess histamine, like yeast, xanthan gum, carob gum, guar gum and soy. Most of those are added to enhance the baking properties respectively consistency. This is because gluten free flours derived from corn, rice, quinoa, coconut, millet, etc. need binders, because gluten is missing, so that the baker’s ware does not fall apart. Today I’ll provide you with some tips when it comes to combining low histamine and gluten free baking. Further down there are more notes to other intolerances. Binders hold the dough together. Too little and the bread or cake will fall apart, too much and everything becomes sticky and slushy. When starting to go gluten free it’s best to stick exactly with the amounts of binders given in the recipe you use. 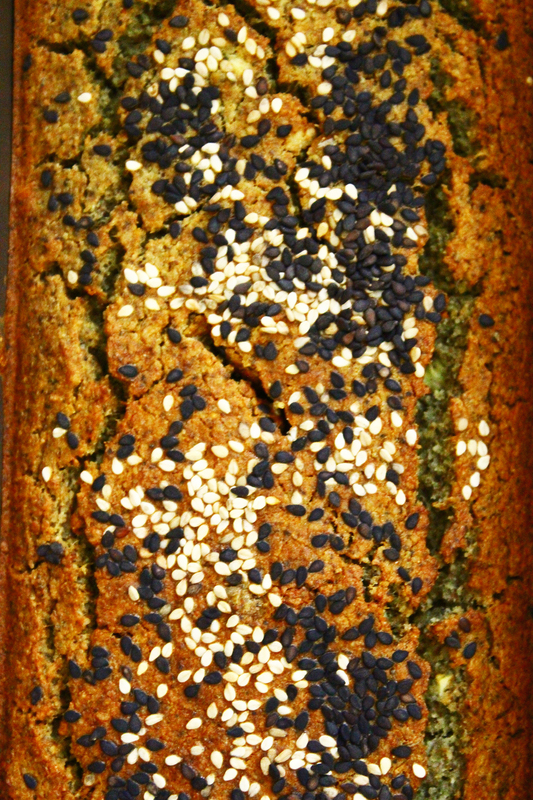 I like chia seed water mix (1 part chia seed & 3 parts water) the best when it comes to baking. You stir this mix once and then set it aside for about 10 minutes to thicken. The result is pudding-like and binds very well. You can use flax seeds the same way. 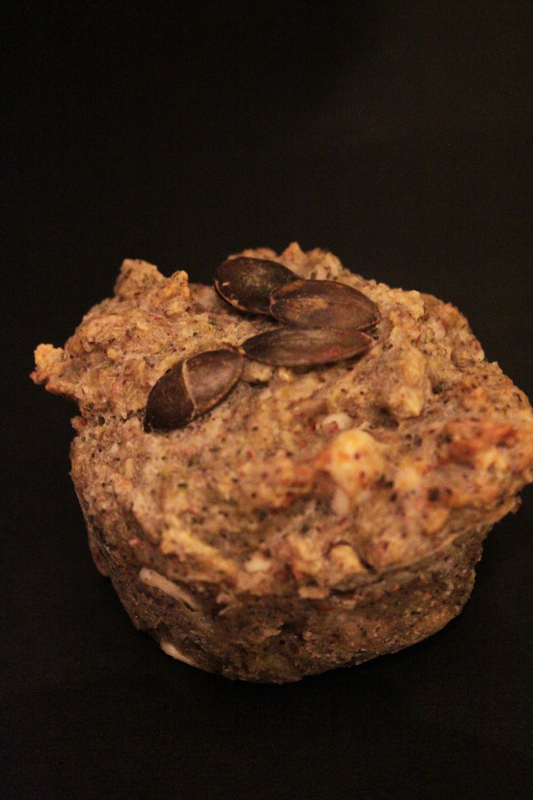 Psyllium seed husk can also be prepared with a little water beforehand or it is just added to the dough like it is. If prepared with water beforehand it binds better, though. (Flour containing) starch makes the baking product soft. When prepared with some water flour containing starch can serve as thickener/binder as well. The rule of the thumb for gluten free flour mixes is 1 part starch : 2 parts gluten free flour, by the way. Eggs can also be used as binders. Most gluten free baking recipes you’ll find contain lots of eggs – at least, in my experience. Yet, it is not so hard to veganise recipes successfully. Chia seed water mix will serve you well here, too as egg substitute. If you like sweet bread, like I do, honey or maple syrup for the vegan option bind as well. This method is especially suitable for sweet pastries, cookies, muffins, cake and alike of course. Apple sauce and lots of veggie purees can be added to muffin- or bread dough. This will produce an extra when it comes to taste, but this also binds gluten free dough. The added liquids can be reduced a little when working with apple sauce or veggie puree. Agar-agar is derived from red algae. When buying a binding agent declared “agar-agar” be sure that it is 100 percent agar-agar. I’ve seen products containing other binding agents besides agar-agar although the product was headlined “agar-agar”. Vegans use agar-agar as gelatine substitute, but it can be used for binding as well. You’ll need really just tiny amounts (otherwise the baking product will turn out to be slushy). In the following I’ll write a little more about HIT and other intolerances. Allergies are a different topic again I’ll have to address in a separate post. When suffering from gluten intolerance or celiac disease one cannot tolerate a kind of protein called gluten that occurs in many grains. usually oat contains gluten because of hybridisation. In special shops (organic shops etc.) you’ll find gluten free oat and oat flakes that are labelled as such. I could not find gluten free oat milk though. Yet, from gluten free oats you can make gluten free oat milk yourself. The following grains and pseudocereals are gluten free and can be used as alternatives to the ones named above. Notes about histamine in brackets. Since gluten is missing, baking properties are different from “regular” flours. To enhance baking properties one can add starch 1 part starch ” 2 parts gluten free flour. Many HIT sufferers tolerate gluten free baking products better than those containing gluten. Spelt and (normal) oat have to be tested individually with HIT, but are usually tolerated. All gluten free recipes can be found under the category gluten free. Soy milk is not an alternative when also suffering from HIT. All lactose free recipes on this blog can be found under “lactose free” in the categories. The category “low fructose” shows you posts concerned with fructose intolerance. As yet, there is not much in there. The problem with fructose intolerance does not end with added (refined) sugar or cane sugar, but also concerns different kinds of foods. Rather much fructose can be found in apple, pear, date, fig, mango, plum, grape, raisin, dried fruits. Sweeteners like fruit sugar, fructose syrup, fructose-glucose syrup, honey, sugar replacements (sorbitol, isomalt, xylitol, maltitol, mannitol), apple syrup, concentrated pear juice also contain a lot fructose. As an alternative dextrose, stevia, rice syrup, spelt syrup and (Aztec) sweet herb can be used. When it comes to sorbitol there are some “common enemies” that are shared with fructose intolerance sufferers. Sorbitol is a sugar alcohol, that people with sorbitol intolerance cannot degrade correctly. Sugar replacements (sorbitol, isomalt, xylitol, maltitol, mannitol) are bad here as well. Especially food labelled with “diet” should be avoided therefore. Moreover, sorbitol is used by food producers as humectant agent (E 420). It’s a substance that often can be found in chewing gum and toothpaste. It can also be found in dried fruits and canned food. Dextrose and regular sugar are known to be alternatives here. There will be a separate post on that topic soon. This is one of the longer recipe titles due to lots of goodness inside. 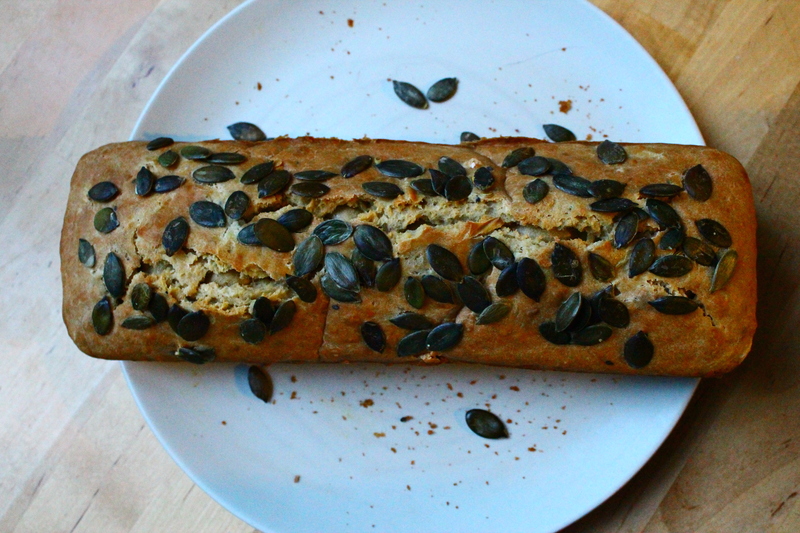 It’s my personal gluten free favourite bread this winter. It’s low histamine, gluten free, lactose free and vegan. It tastes a little of nuts (not all nuts are bad with histamine intolerance). Yet, the green colour is the main highlight about this one! On top of that chestnuts bits are inside. You can enjoy this bread both with sweet and salty spreads. A great recipe to say goodbye to the chestnut season. Carve into the chestnuts, forming a cross – otherwise you will hardly be able to get the chestnuts from out of their shells. Toss into the oven for about 17 minutes at 180-200°C. Turn them once after half of the time. Remove from the oven and peel them (careful, it’s hot). Prepare the chia seed water mix, set aside and let it thicken. Chop the chestnuts into bite-sized pieces. Mix the dry ingredients, add the chia mix, the chestnuts and then liquids. Mix everything with a large eggbeater or with a hand-held electric mixer. Spread oil in a loaf pan, then pour the dough in. Scatter sesame seeds on top. Bake at 180°C (circulating air) for about 50 minutes. Remove from the oven, leave to cool down a little and remove from the pan. Actually gluten free eating is not that hard, when it comes to the shopping list, because gluten is only a thing of grains. So, just omit “regular”, meaning, bread containing gluten, and pasta, and cookies, and so on. I will provide a list of gluten free flours (with notes to histamine) in a separate post to come. All the mentioned grain products can be made rather easily yourself – gluten free. Or you’ll buy ready pasta, etc. that is marked gluten free. Yet, the latter for “double-sufferers” with also histamine intolerance, not only gluten intolerance, is not an option usually. Soon one will discover that it is not just that easy with gluten, because just omitting regular grain products will not do. Why is that? Many processed foods, that actually don’t look like containing grains, contain gluten. Some veggies from the freezer have gluten added, sauces, ketchup and also cream cheese varieties (especially with herbs added), seasoning/broth powder/packet soup, baking powder, ice cream and even fries and crisps contain gluten at a time. Gluten is added as a thickener or to get a nice crust – so fries have regular (wheat) flour added. But also sausages and even cosmetics like lipstick or lip balm and toothpaste can contain gluten [be aware of terms like Triticum (wheat, e.g. Triticum aestivum, Triticum vulgare), Hordeum (barley) or Avena (oat)]. The vegan meat substitute seitan is made from gluten. So, this is where it becomes confusing already. Since 2005 producers have to mark gluten in products (that is where I’m living in Europe). Yet, this declaration policy does not apply to everything, especially the conversion into sugar from wheat starch and alike sugars don’t have to be declared/marked. Sometimes producers will disclose the root raw food containing gluten, others will not. To be sure watch out for this symbol marking gluten free products. Yet, not every producer will acquire the license for this seal/symbol. So, for the time being it is like with histamine intolerance, you’ll have to read the mouseprint and it gets easier the lesser processed foods you’ll buy. Do more stuff yourself. 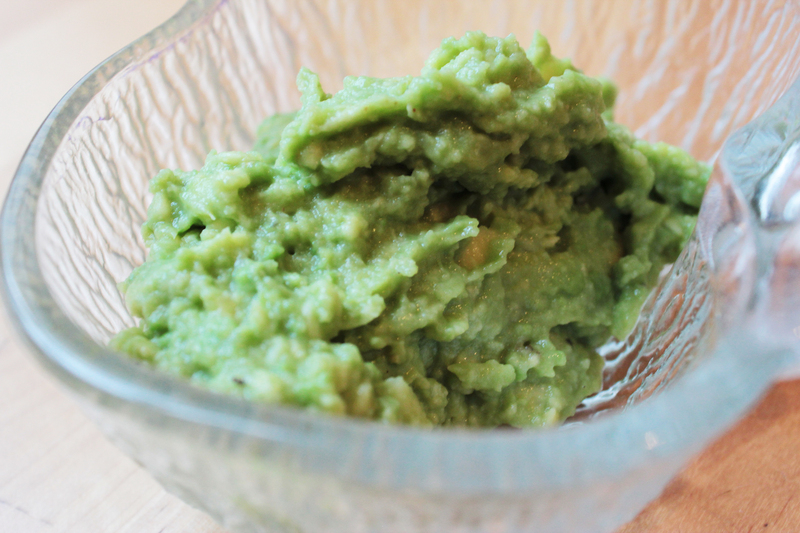 Speaking of making stuff yourself, here is an easy recipe to make guacamole yourself (vegan, gluten free, lactose free), since it contains lemon juice and avocado I’ll mark it as not low in histamine. Peel avocado and cut off the flesh, put in a bowl. Mash the avocado flesh with a fork or alike, add garic, spices and lemon juice and mix. Add salt & pepper to taste. It’s sometimes a bit of luck to find the right/ripe avocado. Tip: ripe avocados are darker, almost a little brownish and soft already. If you pick off the little tip on the top, it should be green under it still, not brown yet. So it’s not too ripe either. If you fetched an avocado that is not ripe yet, meaning, still being still to hard, then you can also cut it into slices and eat on a bread. As of yet it happened to me once that I fetched one like that. The lemon juice is by the way not only for taste, it also keeps the guacamole from becoming brown. The same works with apple slices as well. A little lemon juice will keep them from browning too fast. 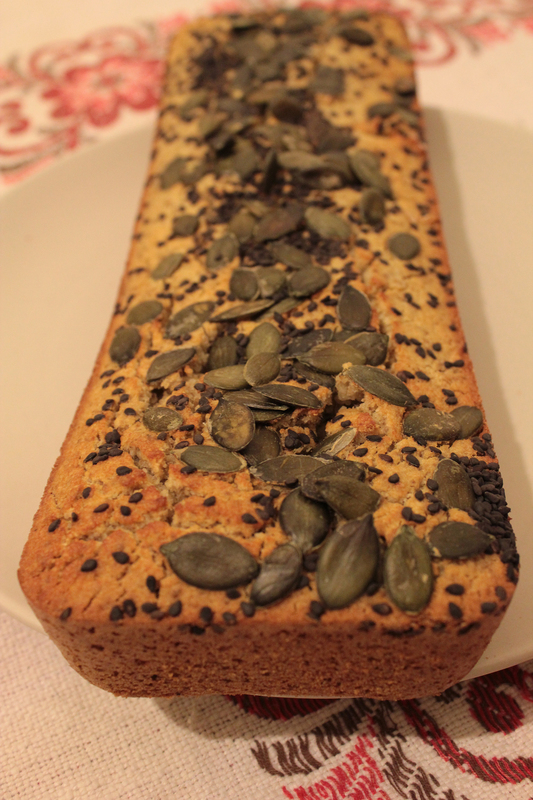 On the German-speaking blog I’ve started a little special on gluten free baking when having histamine intolerance. I’ll try to translate the tips and other recipes in time. To start here I prepared a gluten free bread. The recipe I found similarly on the German-speaking site Pures Genießen. I made little changes. I did not use buckwheat and neither xanthan gum as many with HIT have problems especially with the latter. Buckwheat some actually tolerate. You’ll have to find out yourself by trying in small amounts. If you have problems with gluten as in coeliac disease or alike and cannot tolerate quinoa anyway (cross reactions are possible with quinoa although it is gluten free), feel free to use another gluten free flour that you can tolerate. I used agar agar and chia mix as binding agents what “usually” the gluten would do. When buying agar agar be sure to purchase pure 100 percent agar agar. I’ve seen products with other thickeners or binding agents added that many with HIT don’t do well with (read the ingredient list). This bread tastes quite neutral, meaning quite similar to bread with gluten to which you might be used to (still). 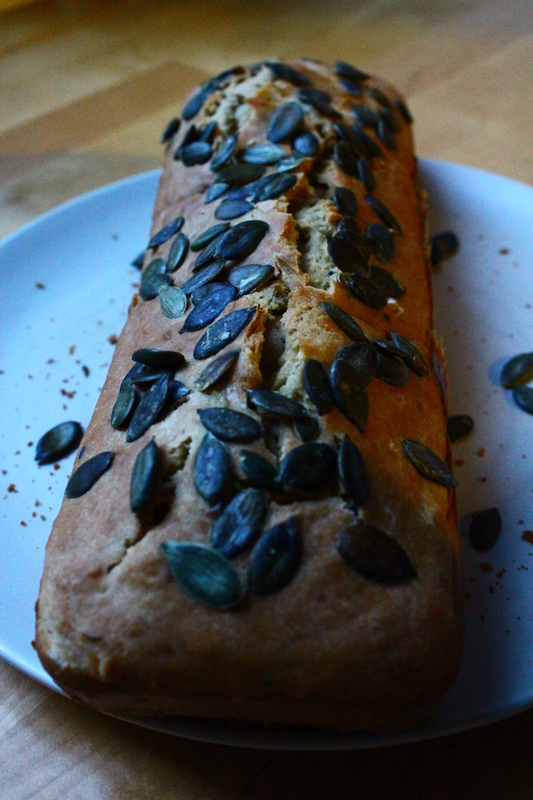 Especially for people just starting to go gluten free this one might be a good bread to start with. 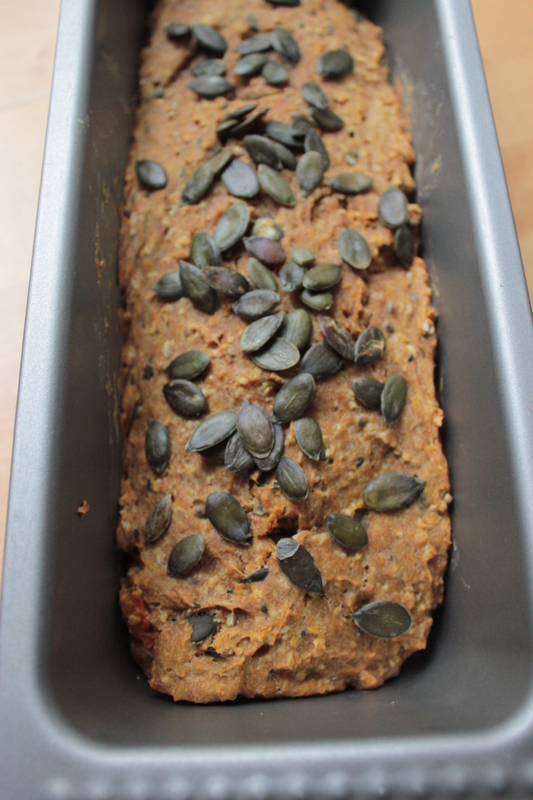 Baked in a regular loaf pan with rather liquid dough this one is great for beginners. Generally you’ll need more liquids when baking gluten free. Loafs which are baked without pan tend to be too hard easily. When baking gluten free in the beginning it is best to stick to the recipe closely -as much as I usually just bake and cook by guess and gosh. Be sure to use just the amount of agar agar as listed otherwise the bread will be “sludgy” or “sticky”. First prepare the chia seed mix with water. Leave aside and to thicken. Meanwhile mix the dry ingredients, then add the chia seed mix and the liquids. Mix everything well with a large eggbeater or hand mixer. Pour the dough in an oiled loaf pan (I usually use coconut oil or hemp seed oil). 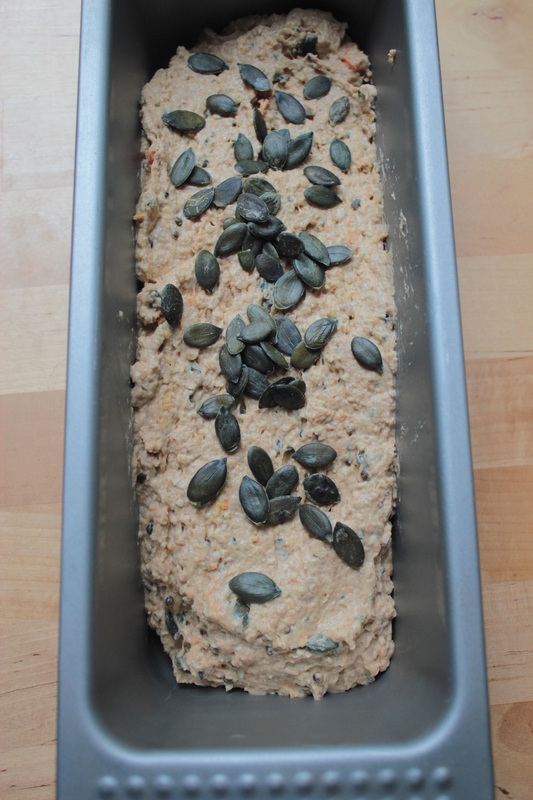 Scatter pumpkin seeds and black sesame seeds on top. Bake for about 50 minutes at about 190°C. Leave to cool down a little and then remove from the pan. 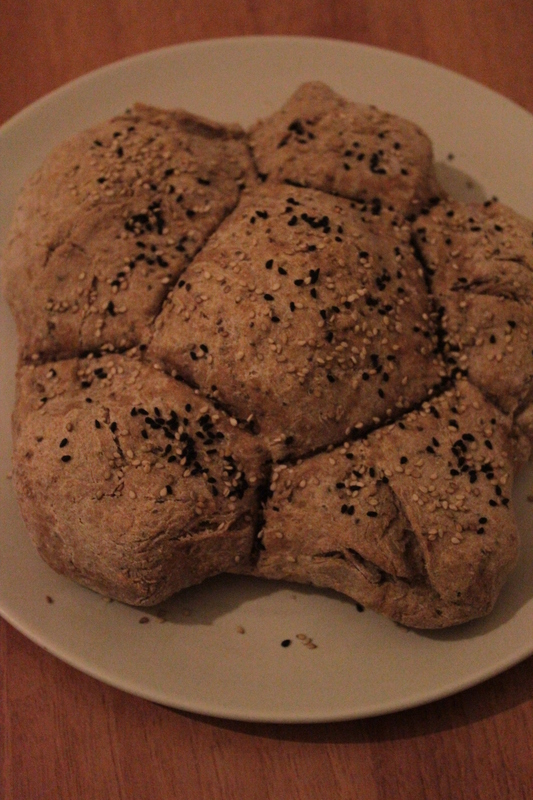 There are already some bread recipes from the loaf pan on this blog. Yet, I like to vary them a little bit each time. My latest addition to the mix are fennel seeds. They add a fresh and at the same time “autumnly” taste to the bread. Just try it for yourself. Furthermore, fennel seeds are great for digestion, just like caraway or southernwood. Mix all dry ingredients. Add the liquids. Prepare a dough either using an electric whisk with dough hooks or a large eggbeater. Pour in a loaf pan. Bake at 210°C in the preheated oven for about 45 minutes. Remove from pan and leave it to cool down. Prepare the egg replacement in a cup. Mix all dry ingredients. Add liquids and egg replacement. Mix with hand mixer or knead with your hands. Rub your hands in a little oil before doing so. Pull the dough into shape. Use something to chip the edges so the bread can be broken apart easily later, e.g. use a spatula or flipper for this (see picture). 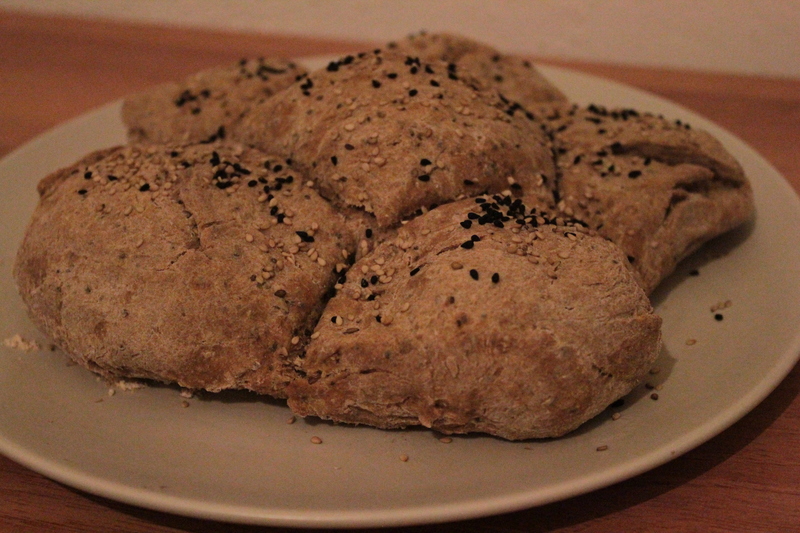 Spread oil on top and scatter sesame seeds and black seed on top of the bread. Place on a baking tin covered with baking paper. Bake at 190°C in the preheated oven for about 25-30 minutes. Leave it to cool down. Again, this recipe is actually not low in histamine, because red wine vinegar and chickpeas are being used. If you can tolerate legumes though, you try this recipe. Just omit the red wine vinegar! Anyway, this recipe is great to serve to anyone not suffering from histamine intolerance. Yummy. Stir in the hot water to the tahini until you get a creamy consistency. Clean the chickpeas and add them to the tahini cream. Add red wine vinegar, spices and olive oil and blend it all. Serve with fresh bread, olive oil, sesame seeds, olives and fresh veggies. Mix the dry ingredients in a bowl, add liquids. You can use a large eggbeater or an electric whisk with dough hooks to knead. Pour in a loaf pan. Bake at 190°C in the preheated oven for about 30 to 35 minutes. Remove from the pan and leave it to cool down. Whisk the eggs with milk. Add oil and baking powder. Stir in the flour. Knead with your heads. The dough is not supposed to stick otherwise use a little more flour. It is also helpful to rub your hands in oil before kneading (plus it’s good for your hands 😉 ). Leave the dough to rest for a moment. Scatter some flour on your work surface and roll the dough with a rollin pin until the dough is about 3-4mm thick. Then cut triangles. You can use a pizza wheel for that. Roll the triangles to little “sausages” and cut them into 4-5 cm long pieces. Arrange them circular on a baking tin or in a springform or quiche pan. Press them together so they stick to each other. If you want to fill a whole springform pan you want to use double the amount as mentioned in the ingredients. Here you can see again how it works. By the way I also got the idea (and the picture below) from here. So, dab some milk on the dough blossom and scatter sesame seeds on top. Bake at 200°C in the preheated oven for about 20-25 minutes until the bread appears golden. The “florets” are easy to break off later, so the perfect party bread. Cooking according to the China Study…?